Editor’s Note: Please see the last version of the LEAH Letter to find out why organic cotton is a better choice for American consumers and Indian and other producers of cotton. The Indian soil is also being destroyed by these pesticides, not to mention the workers who face very lax pesticide regulation including the lack of protective clothing when applying pesticides. Hemp is far better still and must be the way of the future, it doesn’t use any of the organophosphates, period! 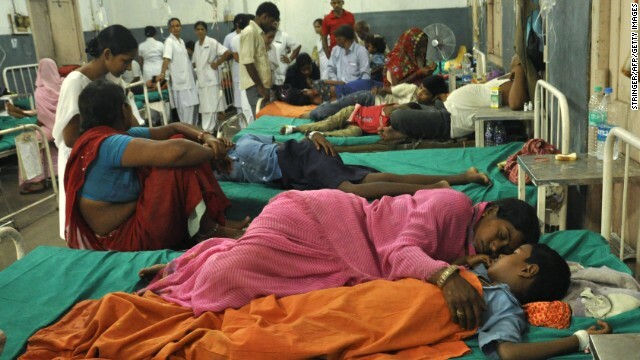 In late July, an Indian public school was the site of a tragic and fatal case of mass-pesticide poisoning. The school—located in Gandamal village in eastern India—provided free midday lunches for all of its students in an attempt to fight poverty-induced malnutrition. Unfortunately, one such lunch contained extremely large quantities of the extremely toxic pesticide “Monocrotophos,” leading to dozens of children becoming ill. Shortly after lunch was served, those who ate started to suffer from acute organophosphate poisoning symptoms. Initially, many were of the children became violently sick to their stomachs, preceding the onset of severe neurological and respiratory symptoms. As of now, 23 children are dead and over two-dozen were hospitalized—we do not yet know what the long-term health consequences for the surviving children will be (it is still too soon to tell what damage is acute and what may last), but they may be severe. 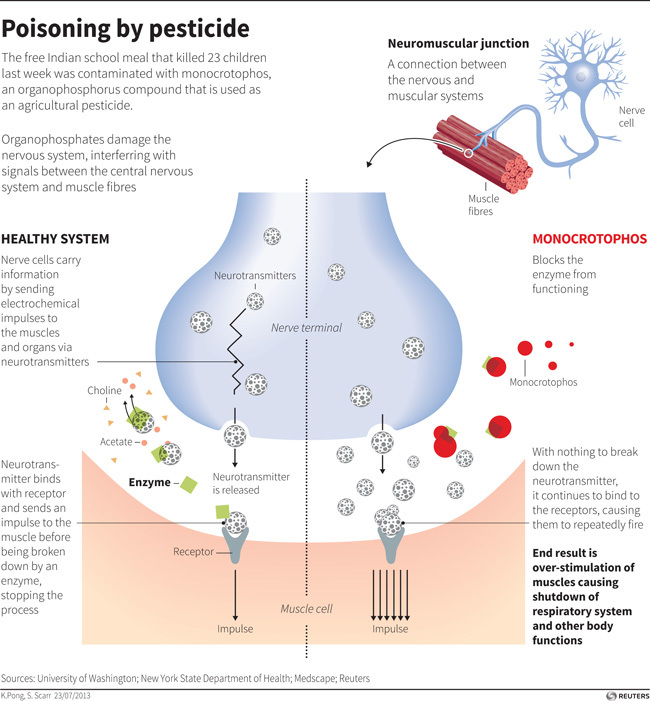 Organophosphate poisoning—even though a single acute exposure—has been shown to cause long-term neurological damage. Studies (such as this one, by the University of Washington) have shown that acute damage can lead to long-term chronic degradation of coordination, neurological function and memory. 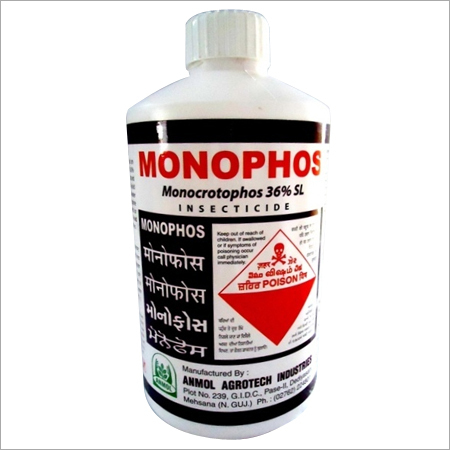 Monocrotophos is an organophosphate which has been used to control insect populations on a variety of crops (including cotton, which is a major Indian cash crop). It was developed in the 1960s, as a new-age pesticide, primarily to protect non-food plants. Applied as an aerosol, monocrotophos pesticides are often used to cover large areas through aerial spraying. Every year, hundreds of thousands of tons of monocrotophos are applied to crops in countries with less-stringent pesticide regulations. Monocrotophose is banned in many countries due to the severe side-effects that accompany its use and its threat to human health. In addition to being toxic to insects, monocrotophos is toxic to humans and extremely lethal towards birds—as such, it is both a human and environmental hazard. The investigation of this incident is still ongoing and there has yet to be any conclusive proof of whether this poisoning was accidental or intentional. That said, one of the chefs who prepared the food noticed a bad smell and color in the meal’s cooking oil, indicating that the oil is a likely source of the contamination (the chef in question tested the food and was hospitalized along with the children). As is evident by this tragedy, we must be extremely careful to avoid accidental contamination of the food and property of vulnerable individuals with chemicals which can harm them. Schools and other locations where children congregate must look at the Indian tragedy and recognize that such a tragedy could happen anywhere; this danger should entice them to take steps to keep powerful and toxic chemicals as far away from vulnerable individuals as possible. The United States government has recognized many pesticides—including Monocrotophos—as toxic and has banned their use within our borders. Unfortunately, a loophole in the law has allowed American pesticide producers to continue to produce and sell some banned pesticides abroad, where some governments have been lax on the issue of pesticide safety. Specifically, monocrotophos was banned for domestic use in the USA in 1989, but it is still produced and exported by American suppliers; currently, the Shell Chemical Company and Dow Chemical are the primary American exporters of monocrotophos. While the specific source of the pesticide that killed these kids is unknown, it is not inconceivable that it was produced in the United States—this should give all of us pause. If monocrotophos is too toxic for us to use, how is it justifiable for us to export it abroad? If a chemical is deemed too toxic to use on our crops, it stands to reason that we shouldn’t allow it to be exported and used on other peoples’ crops—toxicity doesn’t decrease due to exportation and it is simply immoral to let corporations continue to sell chemicals which we know to be dangerous. Beyond the moral argument against exporting such pesticides for use in less-developed countries, there is also a selfish argument to stopping this practice: due to the globalized market in goods, the pesticides which we export to other countries for use in growing agricultural products may one day end up hitching a ride back to us on our food and clothing. Monocrotophos is used in growing cotton (which is used in India to produce low-cost clothing for export) and has been known to leave a residue—remember this the next time that you buy a cheap shirt at Walmart or hear about the USA continuing its policy of selling toxins too toxic for us to use abroad.